You are going to love this pineapple salsa with it’s combination of fruity, tangy, sweet, spicy and crunchy flavor. Wow, the flavors do work really well together with the feta cheese tying it all together. It may seem a little unusual to combine vegetables with fruit but give it a try, the combination is amazing. This pineapple salsa goes great with chicken, pork or beef. Let me say this about pineapple. Once you experience your salsa with fresh pineapple, you won’t be going back to canned anytime soon. There just is no comparison. Fresh pineapple is just… so fresh! To give an analogy just think of tomatoes. Once you’ve had home grown tomatoes, store bought just doesn’t hold a candle to those you lovingly grow in your backyard. It’s all about that flavor bursting in your mouth. Unbelievably good. So don’t be intimidated by having to cut up a fresh pineapple. It’s pretty easy and worth the effort. This pineapple salsa can stand alone as an appetizer with tortilla chips or accompany a nice piece of fish as a delicious side dish. Making salsa is not only easy to prepare, there is no real cooking involved and it’s incredibly healthy. All the fruit and veggies provide for a powerful vitamin mineral punch and there is little fat. There are walnuts but heck, those are the good fats and there is only a small amount in this recipe. I mentioned above that there is no real cooking in this recipe, however the walnuts are roasted. You have options here. You can choose to not roast them or you can leave them out entirely. But try not to. They provide great flavor and crunch. As with all salsas, feel free to add more or different vegetables or fruits. You are only limited by your imagination so go ahead and play. Toss the walnuts in a frying pan over low heat. You can chop all your other ingredients up while they are browning. Keep your eye on the walnuts though as they can burn pretty quickly. Stir occasionally as they brown. When they are done, set them aside to cool. Dice and chop all the ingredients except for the feta cheese. When you juice the lime and orange be careful not to get any seeds in your salsa. You can either squeeze the fruits over a strainer or use your hand to catch those seeds. Your goal is to chop all the fruit and vegetables about the same size for uniformity. Place all ingredients in a bowl and stir to combine. Sprinkle the feta cheese on last and gently stir. 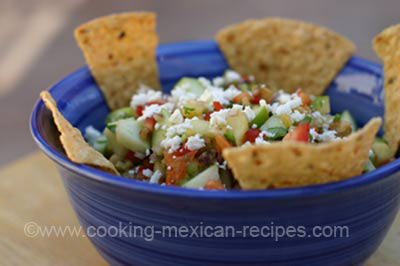 Refrigerate and serve with tortilla chips or any fish or meat.